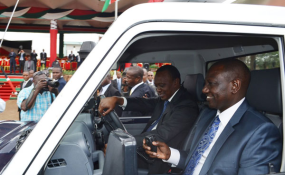 President Uhuru Kenyatta and his Deputy William Ruto (file photo). A high-level meeting bringing together Treasury technocrats and the National Assembly Budget Committee to address the crisis occasioned by the 16 percent value added tax on fuel is set for tomorrow. This came as uncertainty remained on whether the government would obey a High Court order temporarily stopping the increased taxation. The Energy Regulatory Commission, which is expected to provide prices to oil marketers, had not made any adjustments by yesterday. ERC director-general Pavel Oimeke told the Nation on Friday that he was still waiting for the original court documents before making any announcement. There was a similar scenario last weekend after ERC delayed to announce the higher prices, which they eventually did -- ushering in a week of confusion that was characterised by fuel shortage and public outrage. Speaking in Bondo yesterday, Opposition leader Raila Odinga reiterated the need to initiate urgent dialogue to cushion Kenyans from the rising cost of living. He also called for the suspension of the levy on petroleum products. As a co-principal of former President Mwai Kibaki, Mr Odinga said he is ready to offer free advice to Mr Rotich on how to get resources for development without punishing the common man. "We did this when running the grand coalition government and we can do it again. There must be a solution because Kenya must move forward," he said during the house warming ceremony of his nephew Mr Jaoko Oburu in Bondo. As an urgent measure, he said the government should slay the dragon of corruption, which is threatening to derail the gains the country has made. "No one should be spared in this fight which is meant to clean the country for the benefit of ordinary Kenyans," he said. Formed last week, the technical team comprising National Treasury officials and members of the National Assembly Budget committee has been analysing the 2018/2019 budget with a view to identifying areas that can be revised to free some money and in turn enable the government to scale down the VAT on petroleum products. It is this team which will meet on Monday to review progress in addressing the crisis created by the implementation of the punitive tax before tabling its recommendations at a second meeting bringing together Treasury Cabinet Secretary Henry Rotich and the National Assembly leadership next week. Majority Leader Aden Duale confirmed that the technical team will meet on Monday to review progress in efforts to address the fuel tax crisis. "Yes, we are meeting Treasury people on Monday," he said adding; "The experts from the National Assembly and Treasury have been analysing the budget to address some of the shortfalls." The chairman of the parliamentary budget committee, Kikuyu MP Kimani Ichung'wa, was less categorical on the meeting, saying the team was still working on "preliminary" matters before setting a date to review progress made. Clerk of the National Assembly Michael Sialai who attended the first meeting on Thursday directed us to the Speaker, Mr Justin Muturi, for any information regarding the meeting. "Just call him (Speaker), he is the one with all information that you need," Mr Sialai said. A source who attended the Thursday closed door meeting that lasted for two hours told the Sunday Nation that Mr Rotich had informed MPs that if President Kenyatta assented to the amended bill, it would mean Treasury cutting expenditure on key government projects. These include the free primary education, the subsidised secondary education and the free maternal care which might further burden the public. Treasury, according to the source, also proposed budget cuts in various ministries with the House leadership maintaining that such cuts be limited to non-essential services only. It is at that point that the two sides agreed to form a technical committee to further fine tune the proposals discussed ahead of the second meeting set for tomorrow. Those who attended the Thursday meeting included Attorney-General Paul Kihara, Mr Ichung'wa, parliamentary finance committee chairman Joseph Limo and Deputy Chief of Staff Njee Muturi. Mr Muturi stated last week that the Thursday meeting was one in a series they will hold in the coming days in a bid to find a solution to the fuel tax crisis that has caused public uproar since the start of its implementation on Saturday last week. Nyeri Senator Ephraim Maina - who chairs the Energy committee - expressed optimism that President Kenyatta will sign the amended bill into law and give Kenyans a reprieve. "We must find a solution because as things are, life has been very difficult for Kenyans. People have expressed their outrage and President Kenyatta has listened to them," Mr Maina said. The senator urged traders not to take advantage of the increase in fuel levy to arbitrarily increase the prices of goods. Read the original article on Nation. Copyright © 2018 The Nation. All rights reserved. Distributed by AllAfrica Global Media (allAfrica.com). To contact the copyright holder directly for corrections — or for permission to republish or make other authorized use of this material, click here. Are Nairobi Hospital Staffers Down With Cholera? Is Kenya About to Recognise a Third Gender? Kenya: Age of Consent - a 'Nation' Conspiracy?